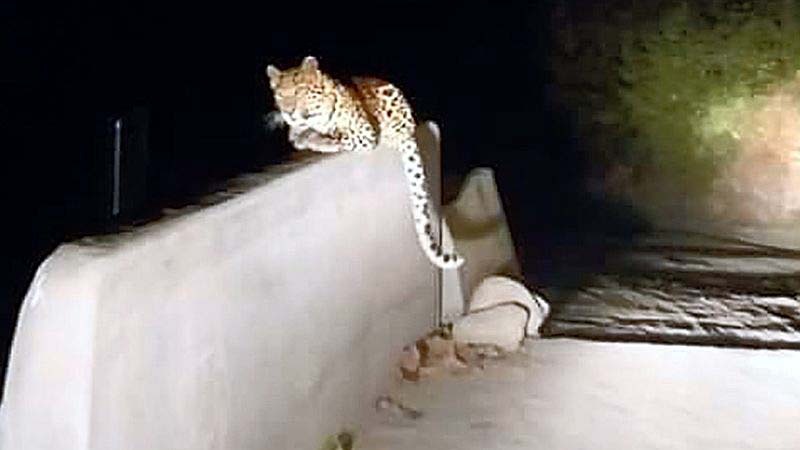 A leopard was sighted around 2km from Darjeeling’s Mall area, the main tourist attraction of the town, on Monday evening, which was termed a rarity by foresters. The foresters said rarely had a leopard been spotted so close to the heart of Darjeeling town and that they would monitor the animal’s movements for the next couple of days before deciding on the course of action. Marcian Joshi, a teacher at St. Paul’s School, Darjeeling, was driving home around 6.45pm on Monday when he saw the leopard. “When I reached an area near Frymal village (in Darjeeling municipality’s Ward 27), I saw a leopard on the road. After sometime it sauntered towards the nearby bushes,” Joshi said. The area is on the border of the Happy Valley tea garden and between Darjeeling Government College and St. Joseph’s College. It is also close to the Padmaja Naidu Himalayan Zoological Park (Darjeeling zoo). Joshi took photographs of the leopard and made a video. Vikas said the leopard population was healthy in Darjeeling’s forests. However, leopards are mostly spotted on the road to Lamahatta and also in the Risheehat area, about 15km from Darjeeling town. The forest officials said they would observe the animal’s movements for now as many leopards return to the forest after straying. The officials will also see if the leopard preys on cattle. Asked if the prey base was dwindling in the hills, Vikas said that during his visits to Darjeeling’s forest he had observed that it was healthy. “I personally believe that the prey base is good in the hill forests. We have seen animals such as barking deer in the forests,” he said.